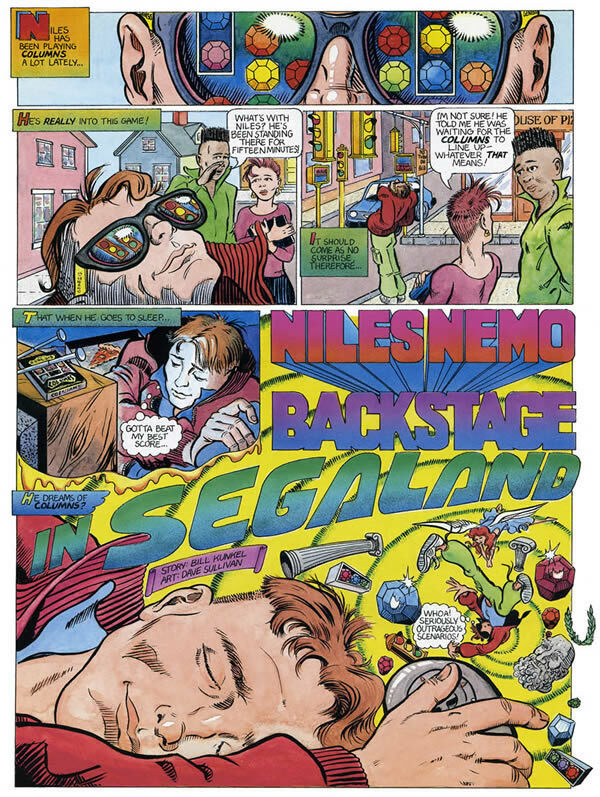 When Sega Visions Magazine launched back in 1990, it included a two-page cartoon featuring a young and hip gamer named Niles Nemo. Every time Niles ate some pizza and fell asleep, he was whisked away into the latest Genesis title. In a grand total of six strips, Niles visited such Genesis classics as Castle of Illusion, Columns, Golden Axe, and Sonic the Hedgehog. It was a cool little diversion, but Sega sadly cancelled the comic and replaced it with one that starred their own hip mascot. The man who brought Niles Nemo to life was Dave Sullivan. Along with writer Bill Kunkel, they gave us some fun strips that were uniquely Sega. Along with the rest of the magazine, they show us what it was like when Sega had zest and vigor, and was only a step away from having it all. Recently, Sega-16 chatted with Mr. Sullivan about his experiences working on Niles Nemo. Sega-16: How did you become the artist for Niles Nemo? Dave Sullivan: The first several issues of Sega Visions were produced by an advertising agency in the Boston area called The Communiqué Group. I had worked for them already on a few unrelated projects and was asked to do Niles when the project began. I was thrilled, as I was and still am a huge comics fan. Up until then I had done very little published continuity art, so I threw myself into it enthusiastically. Sega-16: Did you spend time playing a particular game before drawing the strip? If so, how much? Dave Sullivan: I wasn’t much of a gamer back then (nor am I now). Most often, I was supplied with a video tape of a game being played! I would freeze-frame and do some sketches looking at my TV screen. Among other things, that saved me a lot of time trying to get to the higher levels! I still have an old Sega Master System II machine lying around, though. Sega-16: Bill Kunkel mentioned that it was difficult to develop ideas so that they fit into only two pages. Did you feel this way as well? Dave Sullivan: Bill gave me full scripts to work from, so he had worked out virtually all the details in advance, though I had quite a bit of freedom to interpret the flow of the story. I do recall there were some 12-panel pages, but I enjoyed the challenge. In fact, I had a blast with the whole project. Bill did a great job and was terrific to work with. 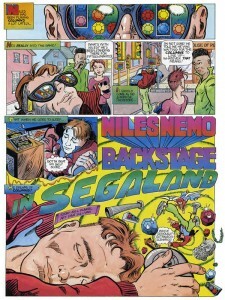 Sega-16: Was any attempt ever made to expand the comic beyond the two pages? Dave Sullivan: Not that I know of. The magazine had only so many pages, and Sega was pretty particular about what they wanted to cover. It was, after all, an advertising vehicle for their games. Sega-16: What was it like to have Sega dictating which games were to be covered? Sega-16: Any idea why Sega decided to pull the plug on the series? Dave Sullivan: In a way, it was typical of the natural order of things. Mainly what happened was that Sega hired a single person to oversee the magazine from their offices in San Francisco. I’m sure he felt the need to put his personal stamp on the magazine and moved the whole project to the west coast. That was the end of all of our participation. Sega-16: Were there any episodes of Niles Nemo that were never published? Dave Sullivan: I remember there was one that was in the works at the end. Bill had done a script in thumbnail form, as I recall. I think it involved a basketball game. It never got past the script stage, though, since the magazine went west. Sega-16: What’s the one thing you enjoyed most about working on the Niles Nemo series? Dave Sullivan: I liked the freedom I had. I had a great time adding little details. Here’s a story with a big secret: I was given the script for the Mickey Mouse game adventure and was really excited about having the chance to draw Mickey. I figured the Disney folks would send some model sheets for me to work from. There was some back and forth with the Disney legal team (massive, I’m sure), and ultimately, they said no one outside of the Disney auspices could draw Mickey Mouse or feature him with non-Disney characters. He could only be featured speaking from off-panel! I even had to get rid of some mouse-ear hats I had thrown in on page one. So, I decided to sneak in what would today be called a “cookie.” There is a circular panel on page two with a couple of word balloons and various details in the drawing that is actually a disguised portrait of Mickey Mouse! You heard it here first! I’m not sure Bill even knows that story. On another note, I believe I was the first person to draw Sonic the Hedgehog in comic book form. 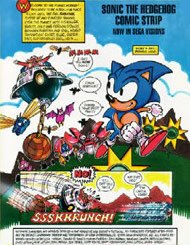 Sega produced a mini-comic not long afterward, but I’m pretty sure I was the first. Some claim to fame, eh? Sega-16: Any chance we’ll ever see him again? Dave Sullivan: I’d be delighted to revisit Niles and his exotic pizzas (another hats-off to Bill for that concept), but I’d also be very surprised! It’s been over a dozen years since the last strip. Sega-16: Due to its status as an advertising tool, Sega Visions was obviously not like most other game magazines. How would you describe your time there in general? Dave Sullivan: I was strictly freelance, but very much enjoyed the people I worked with at The Communiqué Group, particularly John Sprague, who was a top-notch art director. Bill was out west, so we never met, but he was also a pleasure to collaborate with. Everyone who worked on the magazine was enthusiastic and very devoted to keeping the quality at the highest possible level. The preparation of the art was a labor of love for me, but with considerable emphasis on the labor part. I did the pencils on a large layout pad, inked and lettered them on a light box onto Bristol board, then did the color on a separate overlay. This was achieved by putting a sheet of watercolor paper over the inked art and tracing the color areas in colored pencil on the light box. For example, Nile’s coat would be outlined in red pencil. Then I could paint the colors in using overhead light. Finally, I would add some airbrush effects, and voila! This was in the early days of desktop publishing, and though the rest of the magazine was produced using various graphic programs, I was many years away from learning how to use a computer to generate art. I still use pen and ink for illustrations and finish them in Photoshop. Sega-16: Thanks for sharing with us! Dave Sullivan: Thanks for seeking me out and giving me the chance to re-experience a fun job! We greatly appreciate Mr. Sullivan taking the time to share with us. Niles Nemo forever!